Teachers are constantly on the go and moving. Running down the hallway to pick kids up at specials, walking around outside at recess, directing traffic at bus duty, dodging smushed food on the floor in the cafeteria… you name it, we do it. So it’s no joke when teachers go shopping for clothes. We need to be professionally dressed and presentable at all times, but let’s be real… “professionally dressed” is not always comfortable… or affordable. And affordable to teachers is not always appropriate professional dress. We live a tough life and we make some tough calls… starting at 5:30AM when we are picking an outfit for the day. So where is a teacher to go when we need a new pair of pants because our favorite pair now has… umm… bathroom stains on it, or a new blouse because blue and red dot art does not belong on a white shirt? I’ve rallied and asked the experts… experts being you, my fellow teachers… and come up with a list of stylish, affordable places for teachers to shop. Get ready because you’re about to look ahhhh-maaaayyyy-zziinggg 🙂 …and be super comfortable at the same time. Oh, BTW — this is not a sponsored or endorsed post. All opinions are my own and you won’t find any affiliate links. Target is my jam, ya’ll… and not just because of that sneaky Dollar Spot. Target is my personal go-to place for the basics. You know, under tanks, t-shirts, and cardigans… oh yes, the Target cardigan. Let me share a little secret with you… I used to work at Old Navy when I was in college. So I can tell you that there are always great deals, sales, and clearance at ON. Another great place for the basics, but also a great place to find pants. Ahh… the elusive, comfortable, yet professional work pant that looks cute and that you can actually move around in all day. I must’ve had at least 15 teachers profess their love to this style of pant, exclusively found at Old Navy. After a quick search on the ON website, this pant comes in MANY colors and styles (including maternity!) and is superrrrr affordable for teachers. I’ve never met a person who didn’t like Kohl’s. Sales all the time, Yes2You Rewards, and Kohl’s cash… ohhh the Kohl’s cash. Whether you like Lauren Conrad’s line, J.Lo’s or the other name brands, there’s no doubt in my mind that you’ll find what you’re looking for at Kohl’s. Oh yeah, and off topic of clothes… you can find GREAT books for $5 with an accompanying stuffed animal. Two words: teacher discount. As of February 2017, the discount is 5% off with your teacher ID… but there are always discounts and sales to add on top of it. NY&C is a great place to shop, too, if you’re heading to a job interview or job fair. Again, two words: teacher discount. As of February 2017, the discount is 15% off with your teacher ID, and every little bit counts because J.Crew can be on the more expensive end. I tend to stick with staple items from J. Crew… you know the ones that you will wear over and over again, that are worth the investment in a quality piece of clothing. Like a jacket for recess duty, or a blazer. Let me be honest and tell you that my husband may or may not be having a secret love affair with DSW. He works in the corporate world and always seems to find his perfect shoe here. I love DSW for the variety of shoes they provide … and during every season! I’ve found my favorite pair of school sneakers here, and my favorite pair of boots. They always have a great clearance selection too… and clearance is every teacher’s favorite fashion word! I’ll be honest and tell you this is a fan favorite… and not one that I immediately think of when I am searching for shoes. BUT now it is! All of the brands and popular names you love from Nordstrom… and at super discounted, affordable prices. Comfortable, cute, and affordable. Sign me up, NR! Target is a good place to find new shoes, although it’s hit or miss on the comfort of the shoes. It all depends on the style of shoe, I suppose. 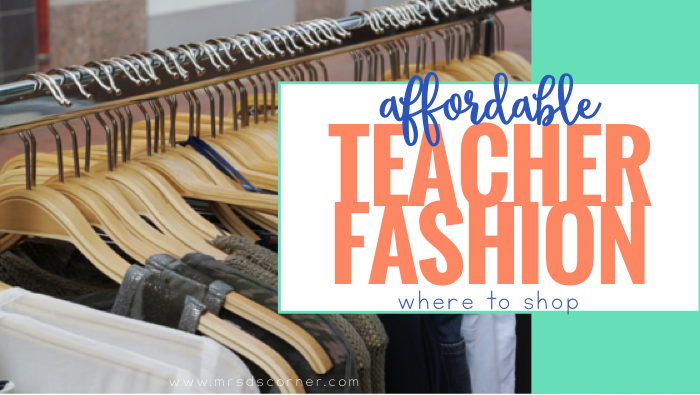 Where is your favorite place to shop for teacher clothes? Loft! Teacher discount! Great quality! Clothes Mentor. They have the brands you listed and I have found all my work pants there, $6 for brand new Loft pants! Can’t beat it. It’s a hit and misd but constant sales means even more discounts! Cato! Always check the clearance. I purchased new pants there this summer for $4.99. Current styles too. Where did you get your TEACH shirt? Love it! I could be a CJ Banks model! Kohls and old navy are my go to stores so far! I love the pixie pants as you stated from Old Navy. Kohl’s has nice blouses, dresses and flats that are comfy even for us women with wide feet as myself. Lord knows it’s hard to find a good shoe especially flats. You can always find great sales at these two stores. Never shop full price.